A while ago, I was asked by Jessy at the Filmoria team to contribute a bit of writing on my favourite use of music in horror. I wanted to avoid all the obvious choices like The Exorcist or Psycho and dabbled with the idea of doing Texas Chainsaw, A Nightmare on Elm Street and some others. But after re-watching Danny Boyle's 28 Days Later, I decided it had to be the use of John Murphy's In the House, In a Heartbeat at the climax of that film. So today I would like to offer you a look at two more pieces I have written for Filmoria's 10 Days of Halloween. The first is my argument for 28 Days Later being a must-see horror movie. If you haven't seen this British nightmare, then really you must! It introduced us to running zombies, possibly the best horror creation ever. The 'Infected' are rage-fuelled, blood spewing psycho monsters that are absolutely terrifying. 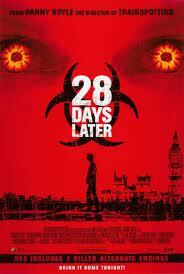 Check out why I think 28 Days Later is a must-see movie at Filmoria here. Then I take a closer look at the music used in the climactic scene as all hell break loose. It is one of my favourite scenes in horror cinema and the music is the perfect complement to the frighteningly visceral visuals. Other contributors to the most effective music in horror feature chose films like Gremlins and even Halloween 3 to discuss. Check out the most effective music in horror feature at Filmoria here. Anyone out there not like this film? What's your favourite horror movie music? I've seen some people bash the movie, but I forget why. I absolutely love 28 Days Later. As for music, I'm watching a horror movie called Occupant right now, and the score is really haunting and organic to the mood of the film. It's pretty awesome.